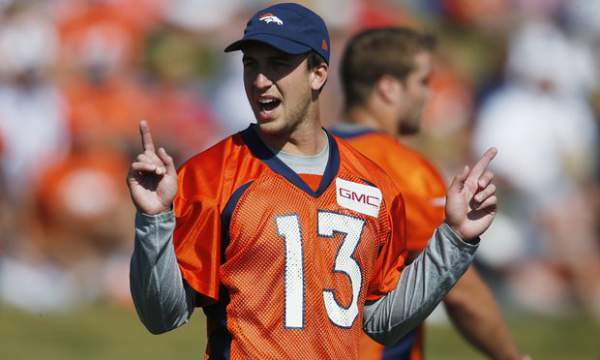 Panthers vs Broncos: Trevor Siemian will be the starting quarterback for the team in the NFL 2016 opening game. The management announced the same that he would have the first spot when the regular season starts in 10 days. Siemian, the 2015 seventh-round pick has beaten the veteran Mark Sanchez and rookie first-rounder Paxton Lynch to open the game. The Broncos made this announcement after a week when Mark Sanchez had a bad week 2 preseason performance against 49ers. Earlier, he was to open the regular season. In the meantime, Siemian was sharp and completed 10 of the first 11 passes and finished with 10 of 14 for 75 yards against the 49ers. And then he got a good start against the Rams over the weekend. Against Rams, he completed 10 of 17 for 122 yards, a touchdown, and an interception. Back in the training camp, the decision to make the quarterback was the most important for the Broncos. Two of its players are now not in the team. Peyton Manning has retired in the offseason while Brock Osweiler has signed with the Texans. “We now have three QB, out of them, two are new to the team while the third one had one regular season snap. To finalize, it will take time. It’s a credit to the teammates as they have husseled and pushed each other so far. The decision which will come out next week will be the final. They will need to put 100% in the game and compete,” coach Gary Kubiak said last week. With the bad preseason match, Sanchez lost the job of QB. In the meantime, Siemian and Lynch had a great preseason. It is also possible that Lynch may get to play as the opening quarterback for Broncos. It’s only a matter of time. But, until then, Siemian has sealed the gig and as of now, he will enjoy the benefits coming with throwing the ball to Demaryius Thomas and Emmanuel Sanders. Moreover, his team has the best defense which will make his life easier. It will be a record soon as Siemian will become the first Northwestern to start an NFL regular-season game since 23rd September 1979. At that, Randy Dean opened the match for Giants against the Eagles.